The winner of the bracelet set is Heather from Heather Stokes Photography. Moving on to ANOTHER giveaway ((you lucky ducks! )), today I get to brag on Caroline of Cotton Lane. This is one girl where over & over we email, tweet, or DM each other laugh about how "great minds think alike." We have the same color preferences & eye for fun accessories. I like her a LOT....and I HOPE that you did not miss her skirt tutorial she did on here a few weeks ago. If you missed out, check it out & make one TODAY! Here are some of my favorites in Caroline's shop, Cotton Lane. Today, Caroline is giving away one of her brand spankin' new products, the eco-friendly mini dots bracelet set. 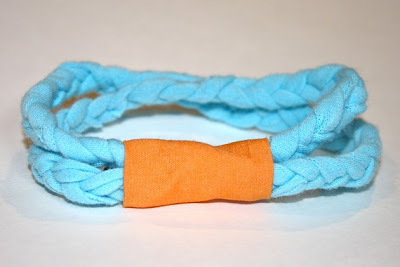 I LOVE bracelets, and this would be such a fun way to bring some color into your outfits for spring & summer! 3. ((Heart)) / Favorite Cotton Lane on Etsy. "GIVEAWAY ALERT! 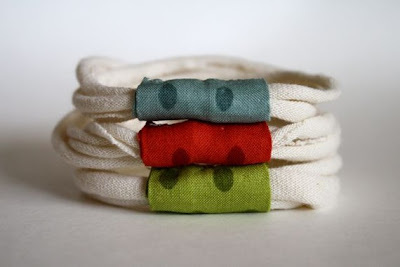 Enter to win an eco-friendly bracelet set from @Cotton_Lane over at @OhSweetJoy's blog! http://tinyurl.com/2ddk985"
please leave a comment for each entry or else they won't count. winner will be chosen Thursday night. You can also use code SONGBIRD for free shipping! booyahhh! Plus, I hearted Cotton Lane on Etsy. And now I'm in love with these bracelets, and I might have to buy one, anyway. I love her eco-friendly bracelets! so cute, the red one I think is my fav! hearted cotton lane on etsy! following both you and caroline on twitter! I love her bunting pillow covers! Cotton Lane is a favorite on etsy. I am following you through google friend connect! I love her The STRETCHY Ballerina headband! I love both of you tweeters. (I follow you both on Twitter). I ♥ Cotton Lane on Etsy! I'm a follower of your sweet blog! I LOVE the fresh cut grass necklace! Just oredered a robin egg blue one and can't wait! favorite item from Cotton Lane is the tangerine and aqua braid!!! perfect spring color. need it. love, love, love the bunting pillow! Love the mini bow and ballerina headbands! I heart Cotton Lane on etsy! 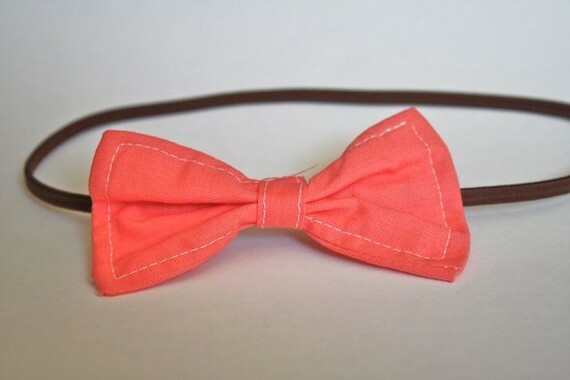 Love the mini bow headband in coral! So sweet! I follow Yellow Songbird on GFC. Love these! I added cotton lane to my favorites on Etsy. I am so a follower. i follow you and am loving her lime green blue dot bracelet!! I follow both of ya'll on twitter! i absolutely love the colorful bunting flag pillow cover in green!!!! Caroline is so cute - and so are her products! I love her fresh bloom necklaces - I want ALL of the colors - and the eco-friendly blue & red bracelet, in particular. Such pretty, springy things! I follow both you & Caroline on Twitter. And I've long hearted her on Etsy! I'm a follower of Yellow Songbird via Google! I'm following you and Caroline on Twitter! I love her new braided bracelets! I just got the yellow bracelet with the red fabric and I'm in love! I also have been contemplating those mini bow headbands for quite a while! I added Cotton Lane as a favorite of mine on etsy! love the stretchy ballerina head band! My favorite is the stretch ballerina headband with two rosettes - I just love rosettes and the pearl center's are adorable! I love the hanging wall pocket in anna marie horner's sketchbook fabric. I am in LOVE with that bunting pillow, it's my favorite thing! I like the mini bow in aqua! I love the eco-friendly bracelets! I have added Caroline to my favorites on Etsy! My favorite is the eco friendly yellow & floral necklace!! Sooo freakin cute. 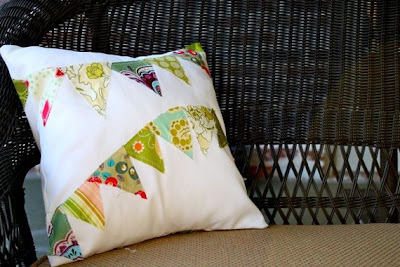 Love the colorful bunting flag pillow cover in greens. I like the eco friendly yellow and floral necklace.. Oh, and the mini bow headband- either in sunshine or coral. I already follow Yellow Songbird via GFC. I follow you and Caroline on Twitter. I love the eco-friendly charcoal bracelet! Thanks for the giveaway! I love the pillows she sells, they're so cute! I heart Cotton Lane on Etsy. I just love the dotted eco friendly bracelet! Thank you for sharing her stuff with us! Love it all. I lurve the mini bow headband in sunshine!